An explanatory video welcomes visitors to your web site and gives them an engaging overview of your business. You'd think a free service wouldn't need much in the way of introduction. And yet, prospects may be wary of signing up for a free consultation. Are there any strings attached? Will I risk sharing sensitive information? An explainer video can help overcome such hesitations. Our client Keyword Experte helps companies optimize their Adwords campaigns, to get more results out of each advertising dollar. As an introduction, Keyword Experte offers prospects a free analysis of their campaign. A short video explanation encourages visitors to request this service. 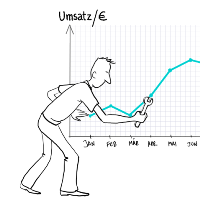 Visual Explainer developed the script and video, and the narration was recorded by the client, in German. If you want people to change, you have to show them why, and how. A beautifully worded essay will carry convincing arguments that might trigger new behaviors. But given our general resistance to change, few of us will take the time to read through the essay, unless we have a strong motivation to do so. This is where visuals can help. A 2-minute animated video explainer will communicate, in an enjoyable nutshell, what's in it for the viewer, and how to get started. With this in mind, the French branch of the European Recycling Platform, ERP-France, commissioned a video to explain what ecodesign is to medium and small producers of electrical and electronic appliances. The purpose of this explanatory video is also to show producers why it's in their interest to apply ecodesign principles, and how they can begin to implement them. When it comes to showing what makes you different from the competition, bullet points aren't very compelling. The French oil company Total recently ordered a Visual Explainer video for their in-house training sessions on phone answering skills. The video was produced in English and in French. To view both videos, click here. New video: Visual Explainer, to go! A new video has been posted. It shows how visual explanations can be downloaded to portable devices for on-the-go explanations. There are two versions of the clip, with and without a music background. Which do you prefer? Leave a message in the contact section to let us know! A new video in the series on emailing digital photos is now available. Part 1 focused on why you should resize photos, and this new part 2 shows how to do this using standard Windows tools. For how-to videos about software applications, a screencast (filming the activity on a computer screen) is the most effective teaching tool. Adding illustrated explanations to the screencast can serve to highlight certain concepts and to make the demo more entertaining.